"Wanna learn to cook 'eggs-emplary' student food?" Isha asked, punning on the word. 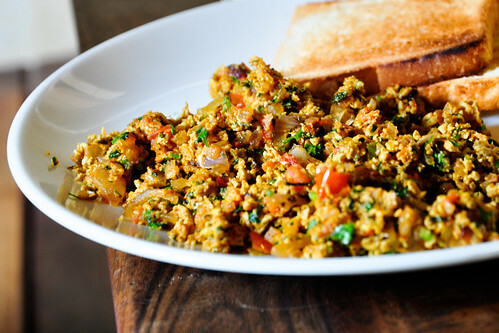 "Egg Bhurji," she said, "or Anda Bhurji, or Egg Khagina as it is known in Pakistan, is a spicy Indian variant of scrambled eggs." "It is a quick & easy dish popular in north and western India and Pakistan. But its real beauty is that you can cook it with almost any food leftovers." "There is no limit on how many different ingredients you use in it, but common additions include onions, green chili, chopped capsicums, chopped ginger, mushrooms, potatoes and chopped tomatoes." "It is usually eaten with naan, roti, rice or used as a filling for pita, tortilla wraps or between two bread slices as a sandwich. It is real student food as it is cheap, and does not require much cooking knowledge." "Chop onions, tomatoes and green chilies," she began, guiding him through the cooking recipe. "Break the eggs and beat them in a bowl. Then heat oil in a wok, kerhai, saucepan, or a non-stick fry pan. Add cumin seeds." "After 10 seconds, add the chopped onion, chilies and ginger. Fry until light brown." "Now add chopped tomatoes, salt, turmeric powder and chili powder. Mix well and cook for 2-3 minutes. Add beaten eggs, and stir with a spatula, until the eggs begin to scramble. Fry this for 2-3 minutes and remove from heat." "Garnish with chopped green coriander, or serve with a dash of lemon juice if you feel the heat from chili powder is a bit more than you can handle." "I've sometimes seen you add tomatoes to the beaten eggs before adding them into the pan, Ma," said Hosh. "Yea," Isha nodded. "It gives the dish a tangy flavor. You can also cut boiled potatoes into small cubes, and add them to make your dish more filling. Other popular variations include substituting egg with Paneer (Feta Cheese) to make vegetarian bhurjee, or substituting other ingredients with paneer." "Peas, carrots, mushrooms, and other similar vegetables, cooked meat or poultry pieces, ham and even pieces of bread can be added to the dish, improving its taste and nutritional value." "Where should I go to learn more about eggs, Ma?" asked Hosh, when he had finished cooking the dish. "To the hen-cyclopedia," she answered with a half-smile. He smiled at her continued play on words. But she wasn't finished yet. "Do you know what happens when you tell an egg a joke?" she asked. "It can't take a Yolk!" he tried. "No," she responded. "It cracks up!" They both cracked up at that. "And what day of the week would chickens hate the most?" he asked her. "Fry-day!" he guffawed, happy to have had the last word. She nodded with amusement, and walked away with a twinkle in her eye.